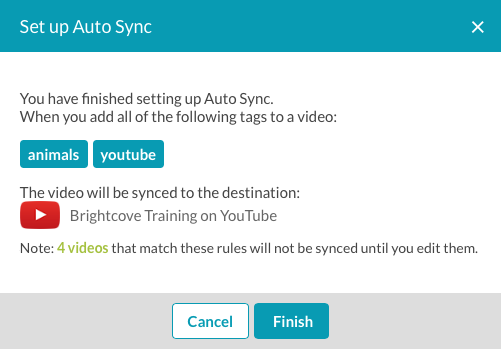 In this topic you will learn how to use the Auto Sync feature in Brightcove Social to automatically synchronize videos to social media channels. 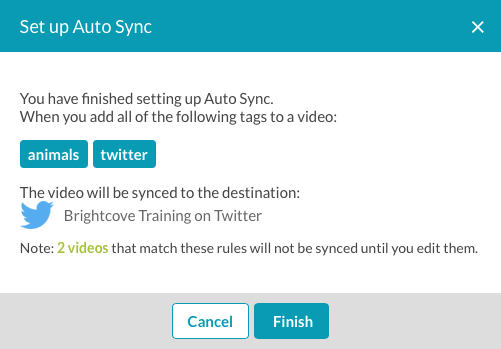 Brightcove Social provides an Auto Sync feature which can be used to automatically synchronize videos to social media channels based upon the tags that are associated with a video. Before configuring Auto Sync, you should have some publishing destinations created. For information on creating publishing destinations, see Creating Social Media Publishing Destinations. Note that using Auto Sync and manually publishing videos using the Social module are independent operations. Auto Sync is not aware of which videos have been manually published using the Social module. 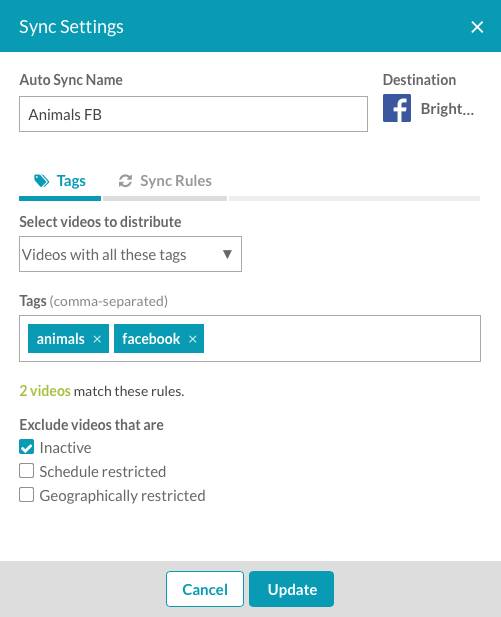 If a video is tagged in a way that causes Auto Sync to publish it to one of your social destinations, it will do that regardless if that video has previously been manually published using the Social module. To configure Auto Sync, follow these steps. After tags have been entered, the number of videos with these tags will be displayed. 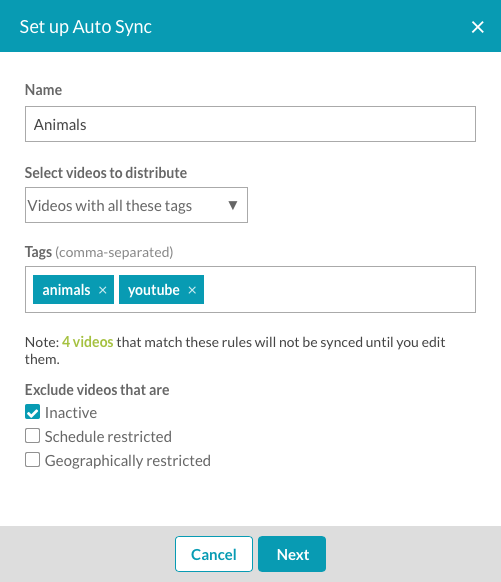 Note: Any existing videos with the specified tags will not be automatically synchronized. Any new videos with these tags will be automatically synchronized. 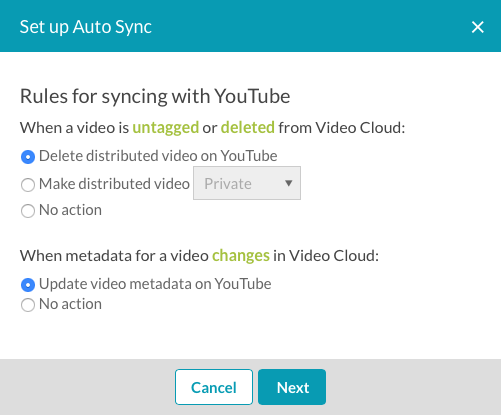 To get your existing videos to synchronize, change the video metadata to trigger an Auto Sync. Click Auto Sync in the left navigation. A list of all Auto Sync names that have been created will be displayed. Note: The thumbnail image will populate once videos have been synced. Click Set up Auto Sync. Enter a Name for the sync. Select the videos to distribute. Unless All videos in this account was selected, enter a comma separated list of tags. Select any videos that should be excluded. Choose a publishing destination to synchronize the videos to. Click Manage Destinations to create new destinations or edit any existing ones. Clicking on a destination will display the destination defaults. Note: Destination defaults can be changed by editing the destination properties. Configure the Auto Sync rules. The options available will change based upon the social platform that was selected. Once videos are published to a social platform using Auto Sync, Brightcove Social does not track any actions that happen to that video on the social media side. 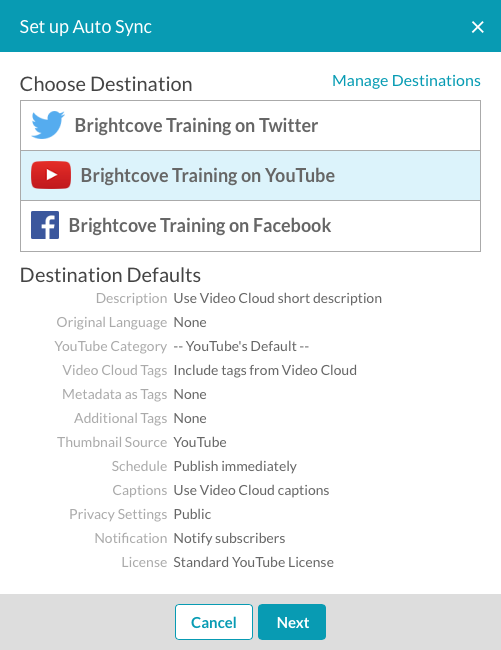 For example, Brightcove Social is not notified when a video has been deleted from a social platform and the fact that the video has been deleted will not be reflected inside Brightcove Social. This can also happen if a social media platform detects copyrighted content and then removes it. 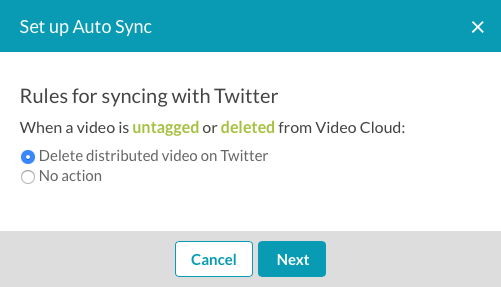 Any subsequent changes to the video on the Video Cloud side that would cause another sync event to occur will cause sync errors in Brightcove Social. In this case, it's a "retryable error", and the retry will cause the video to be re-uploaded with the changes applied. There are an initial limit of 20 possible autosyncs available. If you need more, please contact Brightcove Support. YouTube has a 100-character limit for titles so the Social module will truncate video titles to 100 characters. If the Update video metadata on YouTube option is selected, if the video is upload without captions, and then captions are added, the captions will be passed to YouTube. If the Update video metadata on YouTube option is selected, if the video is upload with captions, any changes to the captions info in Video Cloud will cause the updated captions to be passed to YouTube. Note: When the video source file is updated in Studio, the updated video is not synced to YouTube. This is a YouTube limitation. Confirm the Auto Sync settings and then click Finish. Click Auto Sync in the left navigation. A list of all Auto Sync jobs that have been created will be displayed. Click the links in the Tags column to open the Media module and search based upon those tags. Click the Destination column to open the publishing destination settings. Click Delete to delete the sync job. Click the link in the Auto Sync Name & ID column name to open the sync properties. The SHOW list can be used to filter what is displayed. Click Settings to edit the Sync Settings. Click Update the save the changes.